Grassroots is an erosion control matting designed to protect underlying soil in steep slopes and channels from moderate to high velocity water flows, rain splash and other erosive conditions, while allowing seeds to germinate successfully and grow through the matting providing permanent vegetative reinforcement. Grassroots is made in Australia by Geofabrics from heavy synthetic UV stabilised fibres which are needle punched together into an open weave synthetic scrim creating a three-dimensional structure which holds vegetation in place in extreme environmental conditions. Grassroots is a long term erosion control matting designed to protect underlying soil in steep slopes and channels from moderate to high velocity water flows, rain splash and other erosive conditions, while allowing seeds to germinate successfully and grow through the matting providing permanent vegetative reinforcement. 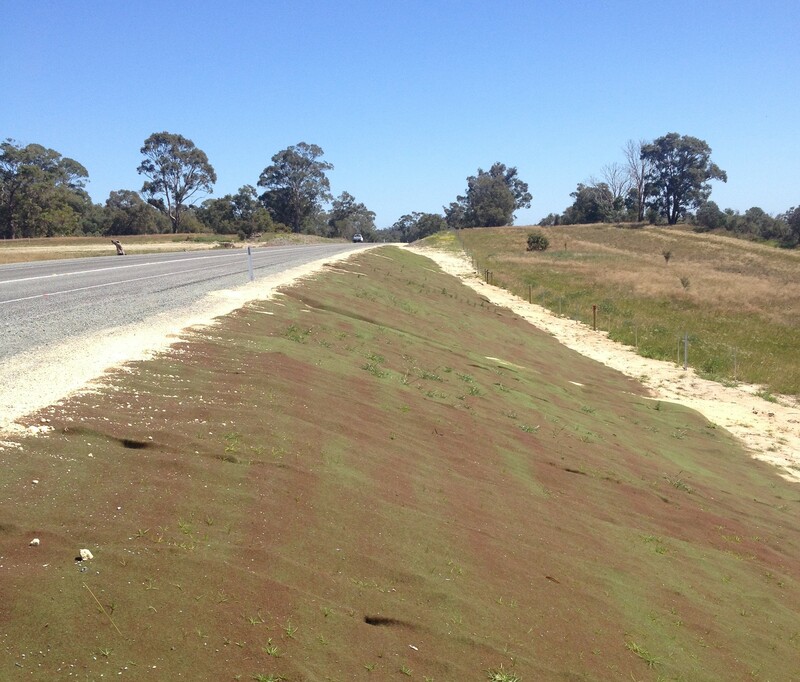 Grassroots has been used successfully in many channel lining and road edge rehabilitation applications requiring increased resistance to soil loss as a result of hydraulically induced shear stresses. Water velocities of up to 4.8 metres per second. Grassroots is made in Australia by Geofabrics from heavy synthetic UV stabilised fibres which are needle punched together into an open weave synthetic scrim creating a three-dimensional structure which holds vegetation in place in extreme environmental conditions. Extremely tough, flexible and economical erosion-control treatment. The fibres used in Grassroots contain high levels of stabilisers which help the polymer from photoxidative degradation. After 1,000 hours exposed xenon-arc light in an accelerated weatherometer, Grassroots showed no loss in tensile strength. Aesthetically pleasing surface treatment which blends in with the environment, even when unvegetated, eventually becoming a hidden structure. Grassroots has been proven to provide a 555% biomas improvement by providing a stable environment for seeds to establish. Simply seed the area to be revegated and roll Grassroots down the slope with overlaps of 50 mm. Pin overlaps at 300 mm intervals. For planting of seedlings simply cut slits into Grassroots and plant.